We never ask for testimonials. However the "Write ANY Book in 28 Days... Or Less!" course is so profound, we have people writing us with unsolicited praise almost every day. You can also read independent reviews of Nick's course at My Writers Circle by clicking here. "Really helpful in giving me a a big boost. These techniques are totally different to just sitting down and writing something. "The [secret method] is a fresh tack, releasing a creative surge of energy..."
"The Nick Daws course is an invaluable writers’ aid. He skilfully guides you through the different stages of composing your book; non-fiction and fiction. It was broken up into the different elements of writing, which were easy to follow and informative. I like Nick's course, it really does work. It got my book finished - within the 28 days! And it was picked for mainstream publication on its first submission, and also by a leading literary agency." UPDATE: Suzanne wrote to us this week saying: "Guess what? I'm hot on your heels now! I just signed a five book deal and three books for other publishers too. Thank you for your course, you gave me my career!" "I was very sceptical before I bought Nick Daws CD course -- but after spending over £200 on a correspondence writing course a few years ago I thought this CD much cheaper and it came with a no quibble money back guarantee. "So I thought I had nothing to lose -- but how wrong could I have been. Instead of losing anything I found that I had everything to gain! "The course is very well set out and simple to follow and I didn't have to sit for hours working. Nick Daws has such and easy to read style of writing that it is almost as though he is speaking to you. It's so easy to understand! "He writes with such an easy flowing style that the course is effortless and after following the instructions for 4 weeks the result is a finished manuscript and tonnes of advice about publishers and publishing and where to start. The course even helped me find plots and subjects that I never even dreamed of writing about. "I have had little writing success in the past but that was mostly due to the 'blank page' syndrome that a lot of writers suffer - knowing what you want to write about but not sure how to go about it. "Now my novel, which I started and gave up on several times over the last two years, is ready to send to a publisher -- and it's the best feeling in the whole world. "I feel ready to tackle any writing project now and I'm looking forward to writing non-fiction books as well, now that I know that I don't need any prior knowledge of a subject to be able to write about it. "This course has really boosted my confidence as a writer. MY only regret is that it wasn't available years ago." UPDATE: Ruth has just got in touch to let us know she's started her second book, all thanks to the Nick Daws course! To quote her last e-mail: "Now I have editors constantly asking me to write for their magazines. I'm starting to feel rich - and I just love being published all the time!" "When I was inspired to write my life's story, I was directed to Nick Daws course. This opened my understanding and knowledge. Many said it could not be done, but because of this eye-opening course, I was able to do it! "I am proud of myself - and it's all thanks to Nick Daws." "I have to admit I bought the course out of curiosity. Being the author of several commissioned and produced plays, and 17 books of fiction and non-fiction for adults and children (check me out on Amazon) with many more in the pipeline, I wondered about the 28 day promise for two reasons. "Firstly, that despite being a very fast writer, I don't think I've ever written a full-length book in a month despite sometimes writing all day every day but secondly, if this was right, I could polish off a book I'd just thought of in a one month window I could just see round the corner. "I started to scan... and found myself gripped! The techniques that most impressed me were the questioning and the breaking down of the writing into small segments of a few hundred words which would quickly build into chapters. As someone familiar with synopsis writing, I'll be able to make maximum use of the techniques. "Am hoping to put it into practice very soon and have become quite an ambassador for the course." "Your practical can-do style is refreshing, motivating and realistic. And your [secret method] technique is ideal for me. "Finishing a book in four weeks is exactly what I'm after, and your system has given me everything I need to accomplish this. "I plan on writing ten books in ten months under my successful LA-based training company, Performance Coaching. Since starting your course I've realized this is possible... and have turned into a fan! Thank you, Nick Daws!" how you can get better grades without effort" within 15 days of my summer holiday. "'Stupid Kid' started as a simple attempt to help struggling students. I teamed up with renowned educational analyst Fredrick Grimmer (Mr. G) to provide new high school students a "crash course" on how to succeed in school. "Since then, 'Stupid Kid' has been warmly received by both educators and students. Using the tactics outlined in your course, I wrote to a few celebrities. Not only did I collect many kind words and endorsements, I was invited to meet international pop artist Jesse McCartney for a personal publicity photo and endorsement. "Essentially, using your course, I went from being a nobody to a rising educational expert within 5 months; it only goes up from here! Thank you Mr. Daws, you've literally changed my life." "Great course. I refer to it all the time! "I used it to publish my first novel, Satan's Church. You can find the official Web site online at www.satanschurch.com.au. "The first print run sold out in just four months and it's about to go into second print in paperback. Thank you, Nick Daws!" "... I had some great ideas for a non-fiction book, but no idea how to turn these into something people would want to read. Then I came across your course and purchased it! "Well that was one of the best purchases I have ever made. Although grammar is not my strong point, your book helped me understand that this was not a problem. Your course gave me the pointers to help me to realize my dream! "I have now had my book published as an e-book on Nospine. I'm hoping to have time to write more books in the future and already have a few ideas. "Using the knowledge in your course, I can do it all within 28 days!" "When I bought your course a few weeks back, I dived straight into it. My book at that point was just a rough draft, an idea floating around in my head. "Now - thanks to your course - my book is finished. It took my just 16 days. I've done a second review and now my editor has the final draft. Thank you SO much for all of your help! The course gets a big two thumbs up from me - and if big toes count, then you get four! "I've already started on my next book!!" "This course is wonderful. I've had so many new ideas in the last 2 days it's almost scary! "I did not notice that the modules were labelled by weeks, and completed the first module in the first day. How exhilarating! I wrote dialogue in the [course secret] exercise, which amazed me as I have always thought I hated dialogue! "The [course secret] idea is so powerful that it has launched a whole new set of thoughts for me around how to approach any project I am considering, whether business or writing. "In fact, I passed on this techniques to a graphic designer I adore. She had landed a huge new project for a high-class law firm. She was designing new brochures and a project proposal. I unveiled the technique and she instantly saw how it would benefit her straight away. We were both stunned at how simple and effective this tool is!! "This is catapulting me into an exciting and expanding future! It's quite a feeling to see it all unfolding before me. So, thank you very much. Looking forward to sending you a copy of my first book!" "I was getting jittery because I needed to complete a script for my TV show. I had a script writer and another freelancer who were writing without chatting to me... me, the person who knew the content for this particular script! "I was the person who had the experience and material which could tell them how I wanted the script to be perceived. After reading the first module, I realize that I can write my own script even better than the original two guys I commission to write it. "I'm looking forward to taking over the complete script writing assignment for my TV show!" "I have written over fifteen published titles -- but have always had trouble with deadlines. "So the title of your course 'How to Write Any Book in 28 Days' caught my attention. I was very hesitant to order but pleasantly surprised that the book exceeded my expectations! "Your book is a true inspiration. The one piece of advice about research was worth the price of the course and will save me dozens if not hundreds of hours. Your [course secret] method will also save me valuable time. You covered the fundamental principles in a clear and logical format. "Thank you for mapping it out for me!" "Great course! Everything I thought it would be and more. I've already completed the [secret] on my book, and already started to [secret] and position my info and research. "It's going to be a great book. Thanks!" "I have just recently received a copy of your course, 'Write Any Book in 28 Days or Less'. "I’m just writing to say that I was impressed with the speed with which it came (4 days all the way from the USA). Also -- the course is amazing! "I’ve been writing every day since. I started to write a novel about 2 years ago but only wrote two chapters before getting lost in the wilderness and not knowing how to proceed. But now it is coming along swimmingly and I do believe that I will have it finished in 28 days. "I feel really positive about my writing now and I’ve also had several articles published on Kwickee Bitesize and a short story. I feel that finally my writing is taking a turn for the better because over the last 2 years I’ve only had one story and two articles published (one of which they spelt my name wrong so I had to explain to everyone that it really was me). "I’ll let you know if (when) my book is published. I’m feeling very confident at the moment!" "Thanks a million! I wish I had come across this earlier. These techniques are excellent! I've owned a number of books on writing techniques, but nothing like this. "I've almost finished my first two books!" "I have written three books already (check me on Amazon) and am working on my fourth and fifth. Two are inspirational, three are fiction. "When I stumbled across the offer, I wasn't naive enough to believe the claim of being able to write a book in 28 days, but for $50 I thought if the course gives me any help at all, it's a small price to pay. "Since last July, I have spent over 240 hours on my current fiction project, most of that in design, storyboarding etc... I have written 45,000 words to my novel, most of that background story that probably won't get into the novel, but necessary and good for practice. "Since getting the Nick Daws course less than a week ago and applying the techniques the last 17 hours, I've written over 15,300 words and that is just one of the things that the course has given me. It's also made writing fun again - I no longer have to pressure myself into writing 6-7 hours per day and deal with a guilt feeling if I don't - I can set a 4,000 - 5,000 word limit per day and feel productive and be able to break for the day by lunchtime. "I realized how much I was spinning my wheels using my method and now know that this novel would take the better part of another 8-12 months to complete if I didn't have Nick's course. "I honestly believe that a first draft can be completed in 28 days - and wouldn't require one to sit at the desk and write 24x7. "I feel like I'm a different person since I've used the Nick Daws course and the confidence in my writing has grown exponentially - in less than a week! I know that this course will allow me to finish my non-fiction book, as I struggled with how to present the chapters. "I tried numerous other approaches to writing since 1990 and looked at several different writing programs until I developed my own process, which I was very proud of and felt was going to work. I have to say that I will probably scrap my method, although I will keep the documentation as it has sentimental value and represents a lot of work, including blood, sweat, and tears. "If I had to put a monetary value on Nick Daws course, based on what I've paid for some other programs, I'd have to say $800 is an underestimate. Thank you Nick!" "Hi Nick, I just wanted to say how pleased I am with your course. I've learned so much and my writing has been greatly enhanced by your work. "With your help, I've just finished my second fiction adventure novel!" "I have read many CD-ROM versions of how to courses and I would have to say, Nick´s version and his ability to detail the in's and out's of writing a book are excellent. "He manages to direct the responsibility on the reader for making a successful attempt at trying to write a book and gives detailed information for getting started ... Nick has taken away all excuses and has lit my fire to begin what has always been my dream. "I am currently reading through the whole course and plan to go back and begin to organize the layout and start asking my questions, I have many questions, and the neat thing about the questions is, I have all the answers. Without Nicks guidance I would never have figured this out, as simple as it is. "For that information alone I would have been willing to pay ten times the price of the course, but I will accept the current charge as paid in full.... ha ha .... Thank you!" "Clear and helpful. I love your engaging tone and wry humour. I'm working on a book about Albert Schweitzer and this will speed things up no end. Best wishes!" "I'm so pleased that I finally wrote the book. If it were not for your course, I wouldn't have even close! I didn't have a clue where to start nor did I know what writing was really all about. I simply knew I wanted to write one! "I have begun the process of contacting publishers and will let you know when it's in the shops. Thanks a million!" "I have dabbled in writing for years, but since I got the Nick Daws course I have been on fire. I enjoy writing so much more and am becoming more proficient at what I love." "I am a published writer and the author of two non-fiction books, yet constantly seek inspiration. Nick Daws' course is insightful and extremely motivational. I've come to think of this as my own personal writer's conference!" "I just wanted to let you know that I really enjoyed the CD-ROM and I have now completed about 2/3rd of my first screenplay using many of the suggestions in the course. Thanks a lot!" "Thank you very much for the quick reply Nick! "I'm actually writing the 2nd draft of my short story I wrote using your techniques. The [secret] method and the [secret] are really amazing! "I must say that when I first saw the advertisement for your course, I rolled my eyes... but I am so glad that I went ahead and bought it! "For what people spend for a single week's worth of morning coffee (not including the donut), they could buy your course! Thank you!" "What a quick reply! Thank you so much! "The audio version arrived yesterday and I've inhaled it! It's fabulous! I love the [secret] and [secret] sections especially. They're exactly what I was having trouble with. And now I can plan the rough draft into a plain ol' notebook :-) So convenient! "As my friends and I like to say: You guys Rock!" "I just wanted to let you know I did receive the course and, even though I'm just a week into it, I am amazed! "My story was scattered in bits and pieces in my mind and the starting point was nowhere in sight. This course has already got me organized to the point that I'm almost ready to start free writing. I just couldn't believe how logical and simple it was to get started. "I had almost let myself believe I could go no further, but now I don't seem to be able to stop writing!" "I just used your 28 days method to write a short story... and it worked! This is the first story I've ever sent to a publisher, and they bought it. "Thank you so much - your product is worth every penny. Feel free to use this as a testimonial!" "Excellent - I am already selling material as a result of this course!" "I've been struggling with (writing) for a long time. No matter what I did, I just couldn't write a proper article. Love romance, yes, articles, no. "But the whole [secret] idea really surprised me. I didn't even realize that I'd worked with [secret] already, so I put together an article on the topic in no time!" "Best of all, while reading your course I got a BRILLIANT idea for a book, which I will write out between now and Friday. The [secret] concept is really going to help here and I've started already. "So if you ask Esther, the Nick Daws course is a Bom!!!!" "I am an English teacher, and in the world of literature, so far an unknown - however I wanted to tell you that the most valuable part of the course is the section regarding [secret]. "During a ten minute period waiting for my family in a shopping mall, I came up with 60 key points regarding my characters using these tricks. Wonderfully productive. "My novel is well on its way!" "Just want to say thanks for a really great course! I'm actually using Nick's techniques in my work as a copywriter. Immensely helpful. Thanks again!" "Very grateful for your writing course. It's an honour for me to write this message to you Nick. As soon as I began writing using your techniques, I found my mind exploding with thousands of ideas... for thousands of books!" "Received the course. I can't get over the enthusiasm it generates. It's worth it for that alone." "My wife and I have two best-selling Christian books in the United States. She just finished our 8th. I'm finishing our 9th. And our 10th book together is at a publisher awaiting publication. "Your material has truly "upgraded" our ability to write, especially quickly, which is a major factor to writing success." "I just wanted to thank you for always responding to my emails... and yes, I did recieve the course. "As far as the course itself, it's funny how simple things are, and how we, as mere mortals, complicate things. I am not even half way through the CD, yet I couldn't contain myself and started writing! "Interestingly enough, I have wanted to write on a certain subject that I have been throwing around in my head but could not solidify any way to go about it. Well, I have nearly 3 chapters written and I am very excited about using that technique in the future. "It's silly but now I want to hurry to start another book because I know that I have the tools. This is wonderful product and I just want to thank Nick and his support group!" "Meant to write sooner to say thank you for sending out the CD-ROM! "I actually can't quite believe the results! I now have a rough draft of my book finished, and my novel looks set to be completed within 28 days. "Not only that: I have ideas for a second novel already!" "I'm just dropping you a line to say how thrilled I am to have the Nick Daws course. It has helped me organize and produce at a great clip. My first book will be finished in weeks now instead of months. I sure hope you get to read my new book, My E-Mail Order Virgin Bride"
"I have spent a great deal of money on writing courses and books about writing. 90% of it was condensed in to this course and there was a lot of new material. "If you are looking for the quick and dirty approach to getting in to print then you have found it. If you want to produce first class work, then some of the techniques and tips will still be invaluable." "I found the course easy to read, and very encouraging. This meant that I turned a vague idea into a detailed plan within a week and have now written the first three chapters, with definite awareness of what comes next!" "I've just finished my feature film screenplay using your course and am currently gearing up to shoot it at the Bristol Old Vic Theatre School. "I started writing it in December and finished it over Christmas. I wrote all of it in a very short amount of time. My writing just flowed... the pages went by so quickly. And there's NOTHING that compares to seeing that fat manuscript on your desk. "I was a professional writer for 16 years, but always found long scripts and stories difficult. But not with the methods in your course. It's very direct and a true inspiration. Thank you, Nick Daws!" "Your course by Nick Daws was a great way for me to study. I printed the lessons out so I could read them at my leisure, and it helps a lot. "I work 2 jobs and have very little time for leisure. When I do relax, I love to write. The new techniques this course introduces are amazing... now I know how many pages should go into a chapter, how many words, so that way I know roughly the word count for my novel. I always had to count each word; now I don't have to do that! "My novel is almost done now, and I have several ideas on starting others. I have already contacted a publishing house , and they are interested in my work. "Thank you, Nick Daws, for the help you have given! I have wanted to be a writer since I was twelve years old. Finally, my wish is coming true. Thanks again!" "Just bought the course. EXCELLENT"
"I just wanted to let you know how much you've helped me with your (secret method). "I am writing a romance novel - it was meandering along and I often lost my motivation to keep writing. I would write myself into a corner without the foggiest idea of how to get out. Not anymore! Your method really works for me and I am extremely happy to have learned it. The writing is so enjoyable now that I know exactly where the story is going. I now have 3 chapters of my first draft done and look forward to tackling it at every opportunity. "PS. I loved the part on the CD where you talk about people who (secret method). You can't imagine how many times I have quoted your words! People always give it a little think, smile and nod in agreement. Brilliant!" "My name is Vincent Uy, I ordered your course and thought your book was great! I really like the tips on how to create characters, plots, settings... and how to make characters believable and likeable. There are many other tips I loved, which I can't think of at the moment! "The [secret technique] I thought was awesome. How the right brain and left brain work in writing is amazing. It will really make my work easier. "You make writing fun, especially when using the (secret technique). I've always held back from writing because I was afraid of being wrong, of having to use big words. I was also scared of using bad grammar. Your book helps me overcome that and moves me forward, quickly! "I'm glad to have found your site. Though I'm new, I'm looking forward to getting to know some of the people in your forum and learning more about writing.
" I recommended your program to a guy I bumped into in one of the book-publishing seminars over here. Hope he'll order your program too. For his sake!" "I wrote you a few weeks ago with a question and you were very polite and granted me the time of an answer. I subsequently ordered your program. As a former engineer, I'm very detail oriented... and find it difficult to write creatively. "Tonight, I followed Module One. I did exactly as you said to the letter. And I was stunned! I was amazed. "This is going to work. I can actually write. I thought I could only write facts... WOW! I can create any plot or theme... There is no end to my new stream of ideas. I can say after just finishing Module One that this entire course is going to be genius. "You have found the answer for us 'illiterits' who thought we could not write. We are capable of so much and often discount ourselves when it comes to creativity. "Thank you for applying your talents toward helping others. This is an ingenious idea and deserves a gracious thumbs up. Module One is more than my money's worth for the entire cost. I am excited. I will sleep well tonight with great anticipations for tomorrow morning." "Thanks for your prompt reply. I will do as you suggest. I appreciated your book and used it for two unrelated projects this year: 1) writing my Ph.D. dissertation in economics, which I finished in May and 2) my participation in National Novel Writing Month in November, during which I produced a 50,000 word manuscript in 30 days!" "I just wanted to write you and let you know how thankful I am for deciding to shell out a meager $49.95 USD to purchase your 28-day writing course. "The process to get the novel written worked wonders for me, putting me probably 7 - 8 months ahead of schedule. I've recently decided to revise a novel that I submitted 2 years ago after I read it and wanted to slap myself for allowing this "trash" to enter the marketplace. "In doing so, I reviewed your revision steps. Your scale and polish technique of numbering the paragraphs backwards was nothing short of pure genius! Actually, with the number of revision techniques I've used over the years, I was a little embarrassed that I didn't think of this, because I strive to think "outside the box." "In using this technique, I am convinced that it will drastically reduce the number of revisions required before I get to make that monumental decision to call a novel completed and ready for submission. "I have read no less than 15 books on writing, and more articles and references about writing, revision, etc... than I can count, and have to say that your process has done more for my writing than all of those combined times 10. "For the first time in my writing career, I honestly feel that I know what to do with my manuscript to get it to sound like I want. "What I like most about your process is just that - it is a process v. a program, so can be twisted, massaged, and tweaked according to one's own personality and approach to writing. Being a computer programmer by profession, I've tried some of the software and found what I expected - programs have a specific design and a specific path to completion and stifle what is inherent in writing - creativity. "Just wanted to say thanks to a job very well done. "Now, it's off to revision - I have a literary agent anxious to read the first 30 pages. "Please feel free to share this testimonial." "I ordered your course and found it fabulous. I then wrote a few books and had them published... one is now available at Amazon.co.uk and a number of other similar sites! "I found your course extremely useful and have told so many people about it. Thank you!" "I just wanted to let you know that I took your writing course, and immediately started writing my book. Unfortunately we were hit by Hurricane Katrina, and lost our home, along with all of it's contents, but the good news is that I downloaded a copy of the manuscript, and threw it into my purse right before we evacuated. "Our house has now been rebuilt, and I finished my book! In the midst of all the chaos, I am now working on a sequel. My first book is called 'Awakening Nicholas'. "I cannot tell you how helpful your writing course was. I have never tried to write a book in my life, but always wanted to. After your course, I sat down to the computer and never had a block. The words came to me with no effort, and no matter what happens with my book, I will always feel a great sense of accomplishment. "I am also working on other writing projects, and I owe this newfound confidence to you. I am certainly no expert, but you were right when you said that people seem to have a certain respect for you when they know you have written a book. "I have had a 'book-to-film' company express an interest in my book, and they only charge a commission if they are able to sell the work. "Thank you again for giving me the tools to do the very thing I have always dreamed of doing." "I'm enjoying the course enormously and I am exceedingly happy that I found the link to this product. The Nick Daws course is full of helpful hints and suggestions and I urge anyone who has ever contemplated writing a book to take this course! "I enjoy the way it is written in plain English and the style is light and humorous. I love the way it dispels the common myths that writing a book is hard work and takes a long time. As the book says, anyone can do it!" 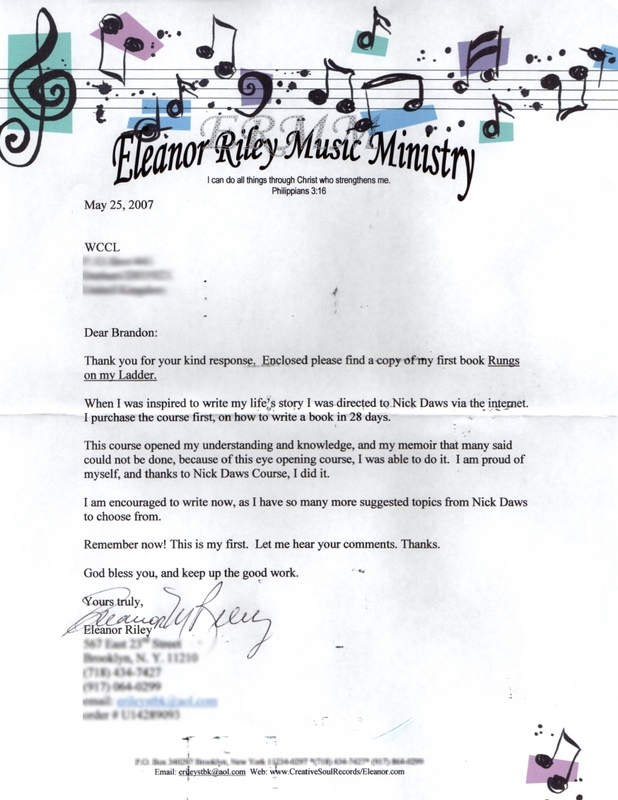 "Thanks, I received the Nick Daws Course on CD and it is wonderful. So helpful and clear! It helped me so much, you can't imagine. "I started again from the beginning because I now understand the mistakes I made. Anyway, the course is just great -- and contains the best help and advice I've ever received!" "I recently purchased your course on how to write a book in under 28 days, and it worked! I am absolutely thrilled. I finished the last word this evening. Obviously, as a first attempt, it is certainly not a work of art, but I am rocketing my way into editing it now. What a sense of exhilaration! Thank you so very much for the advice. It was well worth it." "I've written to you a few times in the past including a request for a testimonial on a novel. I sent my manuscript along with your testimonial to Publish America and they offered to publish my work. "Your writing course and all the personal assistance you've offered has made it possible to accomplish a dream. The outcome of the sales is an unknown since the book is not in print at this time but the first step in getting published has been taken and I want to thank you very much. Without your help none of this would be possible." "I have completed the second book in my Strawberry Fairies series. My book was number four on the local best seller's list. "I have brought the 'real' Strawberry Fairies (my daughters!) to my book signings and the results have been fantastic because the children were so excited to meet them and have them sign the book. "I am also working with a literary agency that will work to sell my series as a movie. Again, thank you, Nick Daws!" "I am writing to say THANK YOU: I have had a yearning to write ever since I can remember. Though I have dabbled in writing here and there and there, my dream of being an author seemed unreachable. "I found your website www.writequickly.com a while ago and was pleasantly surprised at the short free writing course that was emailed to me: that short course inspired and motivated me to start writing again after a long time! "Not only am I enjoying the writing process, but for the first time, I believe in my writing! The mini-course was enough to get me started and a friend of mine bought me the full course as a gift. How beneficial it will be for me! I recently had a poem and an article published in an on-line publication: What a thrill! "Thank you for the motivation, the inspiration and the no-nonsense, practical tips! You have managed to un-do years of various people 'stepping' on my dream and telling me to 'get real' – thanks to you, I know this IS real!" "I wanted to let you know that my book is in the printing stage right now and I expect to have my author's copy within a couple of weeks. I ordered 15 copies at a discount to have for special people. If you would trust me with your address I would like to send you a signed copy in thanks for what your course did for me. "Also, I received an e-mail from a man asking me about your course. He saw my name on your testimonials and was looking for something to help him. He was afraid all the offers on the Net were merely scams to make money. I told him I was looking for that little something I was missing to help me complete all the 'partial' stories I was writing and that your course was the real deal and was much, much more than that 'little something' I was missing. "I added that your guidance and teaching enabled me to get my first book in print. I didn't disclose any information on the course but I did tell him your course offered so much information from beginning a book to the ending. "I offered him good luck in his writing and wished the him best. "I don't know if I told you before but after writing the book using your procedures the publishing company felt there was no need for an editor to review my work and went through with the formatting and printing without any editing on their part. "Thank you again for helping me make this dream a reality." "Thanks for your note. I did receive the Nick Daws Course. Thank you! "I haven't begun writing yet (I also work full time elsewhere), but I have put pen to paper on his 'assignments.' It's amazed me how just a few words of "suggestion" could bring out my imagination . . .
"It is VERY exciting!!! Thanks!" "I do not know where to begin. I have not been this excited in years! "I have been trying to write my book for years. I do have the ideas and I can almost see them floating in my head. But for the life of me have, so far, not been able to put them on paper succinctly. "I have tried. I went on a writing retreat. Full of rubbish! I was stuck on a treadmill. "But when I came to the first writing exercise in your course -- <secret technique goes here> -- for the first time in years, I saw light at the end of the tunnel! "I have hope because I know that I've seen that light!! "I am normally never excited by most things -- and I'm already counting down the hours till I get off and dash home to continue writing! Thank you, Nick!" "I just wanted to write you a special thank you for the information you have shared in your book Write Any Book In 28 Days. I can't express how pleased I am with your methods. This technique takes away all the fear of starting a novel and the overwhelm of the 80,000 word hurdle. I have a plot accoring to the and will be writing my blueprint over the next few days. I anticipate to finish within 28 days, despite the fact that I am a full time worker and am doing an Open Univeristy degree. Your book will make my dream possible!" "Hi Nick! The CD arrived in no time at all and I have already made a start. I have to say Nick that your CD is a BIG 100% GREAT CD. No waffle, no padding, just pure way-over-value for money. I have already got 90% of my structure down for the book - and cannot see any way that I COULD NOT get the finished product in 28 days or less. I am so pleased that I ordered your CD!" "I've just received a copy of my book 'Culture Wise INDIA' published by Survival Books! I got this assignment because of a message you posted on myWritersCircle.com. But, most importantly, your course 'Write Any Book in 28 Days' gave me the confidence to accept the assignment. I had never sold any writing before that... not even an article!" "Thank you for inspiring the writer in me. I took your course on 'Write any Book in 28 Days'. Since then writing has turned into a passion. You can read my stuff on Facebook." "I received my Write Any Book in 28 Days Course. I am writing my book now. The course is wonderful and makes writing extremely simple and easy. I love it and look forward to releasing my best seller!" "After following the Nick Daws course, I published two books - 'Blood Diamonds' and 'Nightmare in Argentina.' They're both currently on the Amazon best-sellers list. Thanks so much for such great insights into the world of writing." ""I have to write and tell you how helpful your book was. I had no experience in writing anything. I had managed Hotels and Resorts with my husband for nine years before we sold out. There was an obvious lack of information for new managers entering the industry. So I wrote a book called “Management Rights Managed Right.” I wrote it following your guide to the tee!!!! Everything flowed as you said by sticking to the guide. "Solicitors and Accountants recommend this as compulsory reading to their new clients entering the industry. I am now intending to write a family book and of course will be using your 'Write Any Book in 28 Days' course." "Thank you. I received my order and am well on the way writing my second book. This information makes this second one a lot easier and more enjoyable to write. I had been writing letters and newsletters for a long time, and I thought that I knew how to write. Was I wrong!? This course has shown me techniques that have caused me to start all over in my thinking. I'm in first grade again and I love it. The word 'Excited' is not strong enough!"